Moliagul is a rural village 15 km north-west of Dunolly and 165 km north-west of Melbourne. Moliagul is situated towards the northern end of gold mining reefs extending generally south of Goldsborough and south-east to Dunolly. 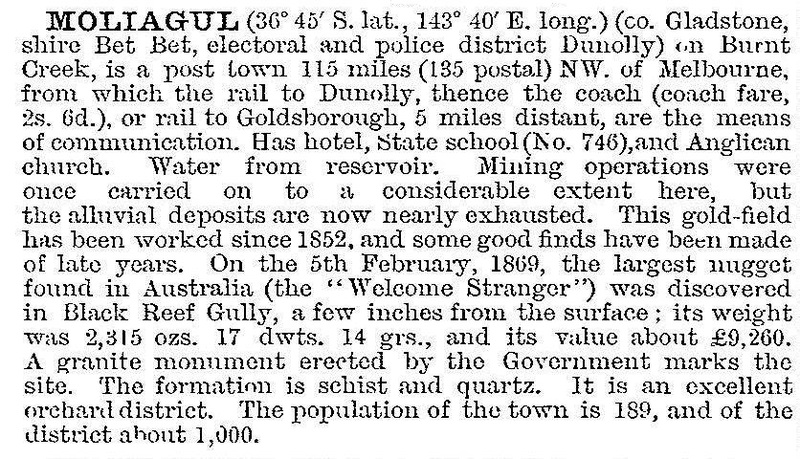 The discovery of gold at Moliagul in 1852 was one of earliest finds in the Dunolly region. Some notable nuggets were found, the best known being the Welcome Stranger (1869) of a gross weight of 2520 ounces (approximately 70 kilograms). The Moliagul township was surveyed in the 1860s, and the name given by its surveyor is thought to be derived from an Aboriginal word meaning wooded hill. There is forested landscape around the former township and Mount Moliagul (525 metres) is 5 km north-west. A school was opened in 1859, moved to a Primitive Methodist chapel in 1863 and rebuilt on another site in 1872. Its head teacher, Thomas Flynn, was the father of John Flynn, founder of the Australian Inland Mission and Royal Flying Doctor Service. Moliagul has an Anglican church (1865), the delicensed Mount Moliagul hotel, a hall, a recreation reserve and memorials to the Welcome Stranger nugget and to John Flynn. The school closed in 1970 and a local trust looks after the building for community use. Prominent among the trustees are descendants of John Deason, the finder of the Welcome Stranger, and members of the Carless family.